The house was cut at 7 1/2", but after assembly, I think I may cut it at around 9" next time. I used George & Basic Shapes to cut the "shingles" for the roof to give it a little more layers (I of course noticed one side was a tad bit longer than the other AFTER I uploaded my pictures - go figure! :)). The flowers were cut at about 1", .8" and .6" (on my Gypsy) and the curtains were hand cut. I hope you win a spot on the team, because this is fabulous. So cute! That is super cute!! Good luck on the DT Call!! TFS!! Take Care!! This is adorable! Good luck! Wow! This is super cute!! Good luck!! Gorgeous!! Add this to the list of cartridges to get. :) Good luck! I think you have a winner! Good luck girl! My goodness this is darling!!! I love all the detail you added. Good luck!!! Your box is spectacular! Good Luck!!! That is totally adorable-good job! 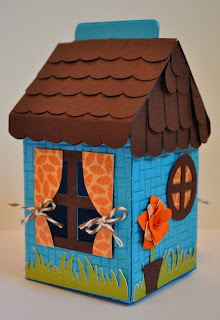 !--Pat N.
I just love your adorable cottage! Oh my cuteness! This is adorable! Best wishes on making the design team! Here's wishing you luck. Your project is adorable! OMG! This is so pretty! Goodluck! Just became ur newest follower! This is absolutely FABULOUS! Good luck with the Design Team calling. You should definitely make it! What an adorable little house! Love it! Great use of the colors! Good luck! Congratulations on your selection to Robyns' design team!!! You definitely deserved it!!!! 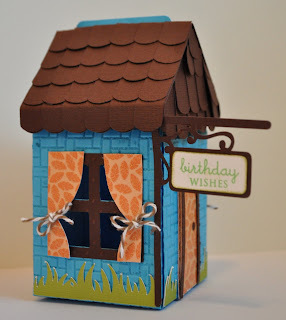 I loved your little house card, and congratulations on being chosen for Robyn's Design Team. I know you worked hard on this project, and it really shows! Roberta!! I was routing for you. Congratulations on making Robyn's Design Team Roberta!! Congrats on being chosen for MPS DT. Your project is amazing. I will become a follower. Can't wait to see what you have in store for us. I just wanted to tell you congratulations on your new position on the My Pink Stamper DT! I am a new follower of your so I will be able to see all of the wonderful creativity you have to share! Wa-Hoo! I LOVED your project so I am so happy to see you as the newest MPS design team member! Congrats! Roberta, Congratulations!!! This is so great:) I am really happy for you!! Congratulatioins, Roberta, on being a new Pink Designer!!! Congrats! if this did not earn a spot I dont know what would. Simply amazing, the detial. Look forward to seeing more of your projects. omg..............what a cute little house this one is. and loving how you use the colors for the challenge. congrats on being one of the new designers. it is fun being a MPSDT. So excited for you! I KNEW you had a winner! Congratulations! I look forward to creating with you on the My Pink Stamper design team! Best Wishes, your entry was awesome. This project is adorable! I have been a follower of yours for a while and I am so happy for you to have been chosen for MPS Designs Team! Congratulations! Congratulations! Your project is awesome! Wonderful details!! Congrats on making Robyn's design team!! Your submission is SO adorable! Can't wait to work with you! OH MY this project is SOOO CUTE! I'm not surprised you made the team! I'm so excited to work with you! Congrats! I know it's going to be great! BIG HUGS! Wow your project is AMAZING! Welcome to the team. I look foward to working with you and getting to know you. Hi Roberta! Congrats on making the MPS design team. What a great project you made! I'm also a new design team member and I'm really looking forward to working along side you! OMG. This is too beautiful. Just found your blog and love it when and look almost all your blog can't stop saying OMG love it my husband just laugh at me. I made the Round Up! It's sure to be couture! I can't believe I won! I'm a DT Top 3!! !